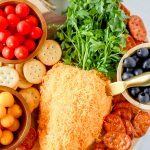 Easy make-ahead Easter appetizer, a fun and festive carrot shaped cheese ball. Let cream cheese and sharp cheddar come to room temperature. In the bowl of a stand mixer fitted with a paddle attachment, combine cream cheese, cheddar cheese, bacon and ranch dressing mix. Transfer cheese mixtures to a sheet of plastic wrap and shape into a rounded triangle. Refrigerate for at least 4 hours, or overnight. Can be made several days ahead. Right before serving, place on a serving plate and press finely shredded sharp cheddar cheese onto cheese ball. Use fresh parsley as carrot top. Serve with crackers.